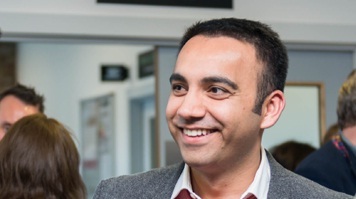 Gurpreet Jagpal, Interim Director of Research, Enterprise & Innovation and CEO of South Bank University Enterprises at London South Bank University (LSBU), has been appointed to the board of Enterprise Educators UK (EEUK). Gurpreet will begin his three-year term in August. EEUK is a national network of enterprise educators from over 100 universities. The organisation promotes enterprise and entrepreneurship teaching and training within the higher education sector. LSBU is a long-standing member and has contributed to a number of important conferences. "This is a great opportunity to contribute to the new strategy and future direction of such an important organisation, especially in this period of change and uncertainty for the higher education sector. I look forward to working with EEUK members and fellow Directors on embedding new ways of promoting and developing enterprise education," said Gurpreet. Since coming to LSBU in September 2014, Gurpreet has brought together research support, student entrepreneurship, business development and other enterprise activities to form Research, Enterprise & Innovation. The department helps students develop enterprise skills by collaborating with industry partners, SMEs and different Schools across the University. Over the last academic year, approximately 4,500 students and graduates have engaged in enterprise-related activities, including starting or growing their own businesses. Launched in 2014, the award-winning Clarence Centre for Enterprise and Innovation has become a home to SMEs and a hub for start-ups looking for business advice, resources and consultancy services. "I hope to use the valuable experience I have acquired directing successful enterprise education projects, entrepreneurship and business outreach programmes at LSBU to make a significant difference in how students are educated across the UK," said Gurpreet. Gurpreet has worked at a diverse range of universities in the UK where he has extensive experience of implementing strategies to develop entrepreneurship, business support, research and company creation.